To celebrate Mother’s Day, a Leonardo, The Virgin and Child, with Saint Anne. So here we have two mothers: the Blessed Virgin, of course, and her own mother, Saint Anne. You may admire the masterpiece at Le Louvre. At Leonardo’s death, the painting (oil on wood) was purchased by his last and most devoted patron, King François I. It then left the royal collections at some point, but was later reacquired by Louis XIII. It has remained part of the French royal, then national collections, ever since. The composition is triangular, with Saint Ann as the summit. To the left, the Virgin is leaning towards the Child, himself preoccupied by the lamb, symbolizing the passion of Easter. 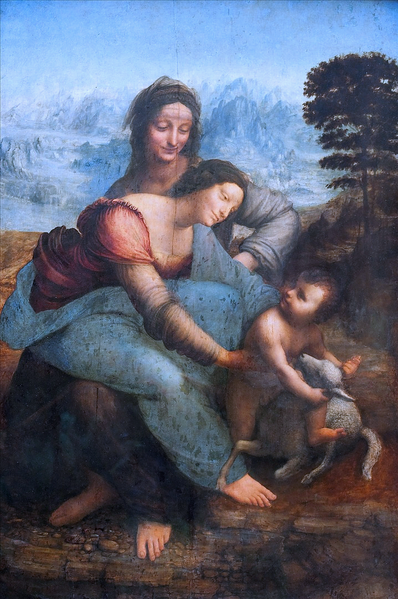 Leonardo, as often, chooses an unusual image: Mary is sitting in her own mother’s lap. What better way to describe the bond of maternal love uniting three generations? Two further notes: Sigmund Freud devoted an essay to this painting, where he discerned an upside-down vulture, supposedly linked to a childhood memory of Leonardo (not one of Freud’s most convincing theories.) Also a recent restoration triggered a heated controversy.